Wolves of the Calla | What I think About When I Think About Writing. ← The Twelve Steps of Facebookers Anonymous. So as I head straight into volume five of Stephen King’s magnum opus, I wish to share some thoughts with you about the previous one, Wizard and Glass. Each volume so far has offered something special to me, the first-time reader. With The Gunslinger, it was the introduction to a world that was somewhat like ours, but not quite. I still don’t know if there was a nuclear war that destroyed a modern civilisation, and thereby creating a world that Serge Leone would have been proud of. It is, to me, The Good, The Bad, The Ugly…and the Fucked-up. 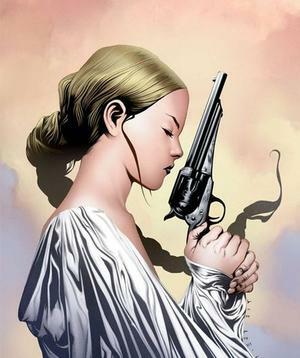 Roland Deschain is an enigmatic a protagonist as you’re ever likely to read in modern fiction. With The Drawing of the Three, I was captivated by Eddie Dean and the woman who would eventually become Susannah Dean, Odetta Holmes. It also pointed out that our heroes were not guaranteed to come out of any given situation intact. I felt their pain, their joys and their terror. It was the start of what was going to be a long, long journey – a journey that might end in death for each of them. With The Waste Land, it was the return of Jake Chambers, the introduction of Oy the billy-bumbler, and the enormity of the quest ahead of this disparate group of travellers. It was my favourite of the three book so far. Scenes of intense and horrible violence permeated through each section; scenes that still cause me to sit back and marvel at King’s artistry. Susan Delgado: Loved and Lost. Wizard and Glass was something else altogether. Contained with its passages of action, heroism, sacrifice and more violence is perhaps the most romantic love story I’ve read since The Prince of Tides. Here Roland told the tale that had haunted him for god knows how many years (time flows differently in Mid-World): how he met – and lost – his one true love, Susan Delgado. The word “heartbreaking” can be overused and indeed, in the wrong hands, one such story can come across as sentimental, irrelevant and trite. One of the reasons it took King so long to write this volume was that he wasn’t sure if his talent could handle romance in its truest form. But the mark of a good writer is when he or she can follow a path, work through their fear and uncertainty, and arrive at their destination having learned a valuable lesson. I wasn’t sure if I was going to enjoy Wizard and Glass. King was sidelining Eddie, Susannah, Jake and Oy for an extended flashback. But it was a story that needed to be told and I’m very glad that he did. I can say with hand upon heart that I will shiver, as my friend Liz Czukas does, at the mere mention of the phrase “Come, Reap” for many a dark night to come. But the killer touch comes at the end of this volume; when Roland and his friends take one further journey into the Wizard’s Glass and see…well, if you haven’t read it yet, I recommend you do so now. I’m not going to spoil it for you. I’d be doing the book and its author a disservice. This entry was posted in Books, Reviews and tagged Eddie Dean, Oy, Roland Deschain, Stephen King, Susan Delgado, Susannah Dean, The Dark Tower, Wizard and Glass, Wolves of the Calla. Bookmark the permalink. 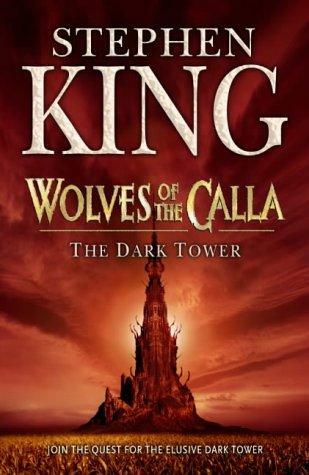 Wolves of the Calla is flat out my favorite of the series. It touches on so much of what has become the pulse of pop culture in the last decade and does so while telling a truly timeless story about some our worst fears. Enjoy sir!